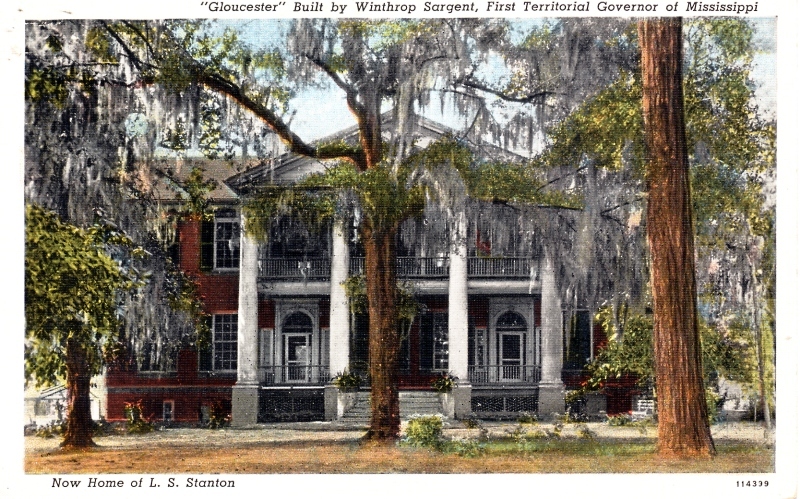 Gloucester, Natchez – (1803, 1807, c. 1830) (National Register) Also occasionally referred to as the Samuel Young House or the Winthrop Sargent House in reference to the first two owners. Gloucester was constructed in 1803 as a hipped-roof, two story structure for Samuel Young. 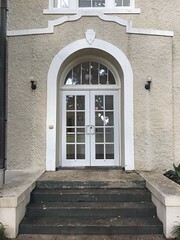 In 1807, new owner Winthrop Sargent, the first Governor of the Mississippi Territory from 1798-1801, hired an unknown brickmason to enlarge “Gloster Place.” That brickmason added the two fanlight entrances with the unusual flanking, detached sidelights, as well as the half-octagonal side elevations. The Tuscan portico with a bull’s-eye window in the pediment was added circa 1830. While overshadowed by many later Natchez mansions, Gloucester is the oldest of Natchez’s grand mansions, predating Levi Weeks’s arrival by several years, and is an excellent example of Federal architecture in Mississippi. This grand home is like looking into the past, how glorious it must have been to live in a home like that. If walls could talk can you just imagine what amazing stories they could tell…….. 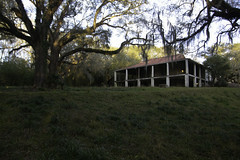 I was blessed to own and live in this great home with my family in 1999-2001. What an amazing experience. Beth, I wonder if you might give me some detail. I live in Gloucester and am researching the Sargents and African American history. lisebreen – My husband, Paul Dawes, and I live just down the road from you at 254 Lower Woodville Road. Our property was once part of Gloucester Plantation. We are the last high point before St Catherine Creek. I lived just across the creek as a young child so I grew up here in this neighborhood. 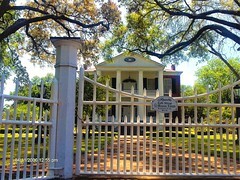 I am also very interested in the early history of Gloucester Plantation and before when the Natchez Indians were here. Because of our proximity to the Grand Village we most assuredly have some history to be told there as well. I would love to talk with you sometime. Could you please tell me if Deakles still are the owners of Gloucester. 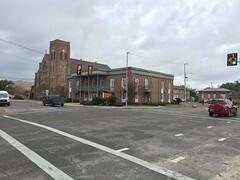 My grandmother was born (1865) and raised in the house and I have several items from the home that I thought should go to the historical society, however I have been told Natchez does not have a building for items. I thought maybe they could go back to the home. i am a first cousin to Gwen Deakle. They do still own the home. I am Grace Dillon and live in Natchez. Gloucester is one of the few antebellum houses I have not seen. Is there any way to be given a tour? Terrific. When might I call? Might you have anything related to the Sargents, or memorabilia and images of Gloster Place from their tenure? If so, the Sargent House Museum might want to discuss. We have some furniture and portraits on display from Winthrop Sargent and George Washington Sargent’s residency at Gloster Place. Thank you. I have several pieces of china (mostly Chinese) that were shipped from Glouchester in about 1905. There are some books that have the signatures of GW Sargent. There is an 1870 sampler made by Julia Gordon Moore. There is a large portrait of Margaret Sargent (pastel), a family crest on silk, a set of early Tiffany silver, and a few pieces of jewelry. The majority of furniture and artwork were lost in a 1947 fire that destroyed our ranch. I have wanted the pieces to go back to Natchez. 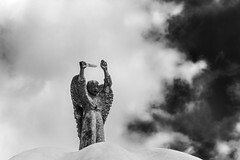 Some I would be willing to let go of now, but others I just want to be able to list where they should go when I am gone. Would you mind telling me what books have George Washington Sargent’s signature? I would love to see a photograph of the pastel of Margaret Sargent. The Sargent House Museum in Gloucester, MA, may be interested in these items. You can get an idea of the Sargent House at the website at Sargenthouse.org. and see snapshots of a miniature portrait of GW, a portrait of Jane and a Hiram Powers bust of Mary Sargent on our pinterest site. It would be interesting to see if the china matches ours in any way. Would also love to know if there is a list of the items that were lost in the fire. Thank you. I have some of Winthrop Sargent’s items from Gloucester, including large dining table & matching buffet with mirror. Our family will travel there within next couple of years, depending on schedules, as we have not done so in the past & look forward to it. Anyone with information on the present owners of the property please share with me, as I recall a family member had told me about a restoration of the grand home a few years back but I can’t remember which relative it was & many of their memories are fading. 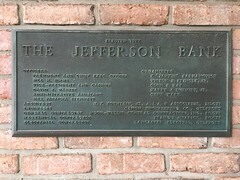 Jeff, I’m sure the current owners would be very interested to meet you when you get to Natchez. Contact the Historic Natchez Foundation (601-442-2500) and tell them who you are and ask if they can get you in touch with the current owners. Good luck! Hi Jeff, I am interested in learning more about your Winthrop Sargent objects. You may want to visit the Sargent House Museum in Gloucester, Massachusetts, and see their Gloster Place breakfront, wine cooler, and bed. You can see photographs of these objects and family portraits on their website. The widow was Mrs. David Williams nee Mary McIntoish. She and David had four children . Her second marriage to WInthrop produced two children, sons Fitz William Sargen, tnamed for Winthrope’s younger brother and George Washington Sargent..
Hello Virginia Urquhart, Do you have any correspondence or family memories related to David Urquhart, Winthrop Sargent’s New Orleans-based attorney of 1807, 1813? I understand he married Mary McIntosh William’s step daughter, Mary Gayoso Sargent. Perhaps you can clarify the relationship.Thank you.